You are here: Home Products By Brands FLUKE-USA Combo Test Kits Fluke 179/TPAK 179 True-RMS Multimeter & ToolPak Combo Kit Save when you buy the Fluke 179 Multimeter & ToolPak Magnetic Meter Hanging Kit together. 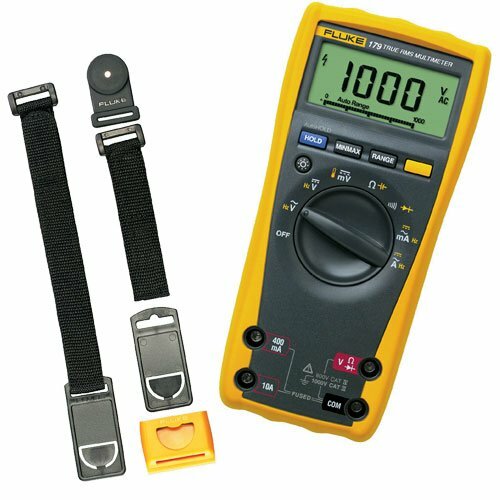 Fluke 179/TPAK 179 True-RMS Multimeter & ToolPak Combo Kit Save when you buy the Fluke 179 Multimeter & ToolPak Magnetic Meter Hanging Kit together. Kit includes: 9 inch hook and loop strap, universal hanger clip, hook hanger for non magnetic surfaces and a strong magnet. Solves almost any hanging and positioning problem you may face. The universal hanger allows you to hang your meter on nails, hooks and many other objects.